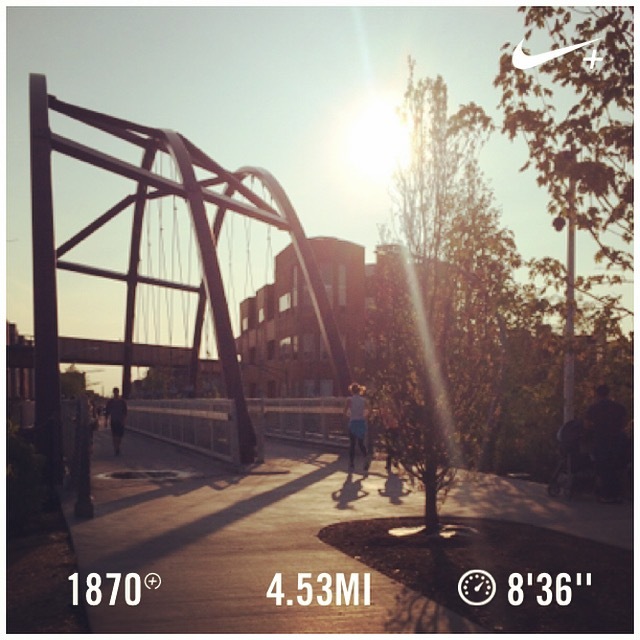 After five-plus years of year-round running (and training) in Chicago, I often get bored with my same old routes. I still adore my neighborhood and have a passionate love for the city’s Lakefront Trail, but I welcome changes of scenery with open arms. The park at Milwaukee Avenue is one of The 606’s crowning jewels. Chicago’s newest park was created from the remnants of the former Bloomingdale Line elevated train. At 17 feet above street level and 2.7 miles long, The 606 connects the Wicker Park, Bucktown, Humboldt Park and Logan Square neighborhoods. 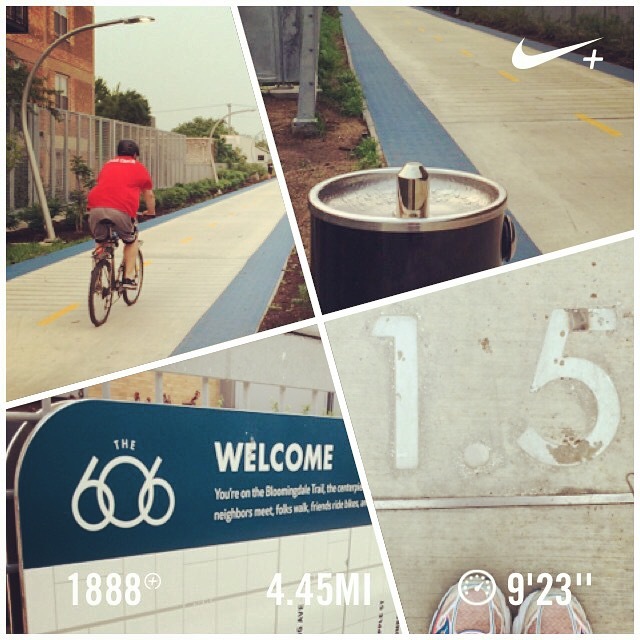 The 606 features parks, sitting areas, multiple access points, water fountains, and of course, a trail for runners, walkers and cyclists. And so far, I’m loving it. The nearest access point to my home is about a mile away and smack-dab in the middle of the trail, giving me the option to go east or west. Each tenth of a mile is permanently marked in the concrete, and 2-foot-wide blue rubberized shoulders are tailor-made for runners. The majority of The 606 goes through quiet residential areas, but even when it crosses the main thoroughfares of Western, Milwaukee and Damen Avenues, the traffic noise below is not overwhelming. It feels peaceful. But it’s also tight quarters up there. The trail is only 14 feet wide (compared to the Lakefront Trail’s 20 feet), so combined with access point blind spots and overall “newness,” The 606 can be a little dangerous to navigate during peak use times. Warning signs (and even trail etiquette signs) would be helpful. I’ve also only spotted two drinking fountains — both near the trail’s mid-way point — so I’d love to see more of those. Also, the lack of shade is an issue. Those newly planted trees need to grow faster, darnit! I realize it’s a work in progress. The 606 has only been open to the public for a month, so many of the finishing touches are still being made. Landscaping/planting is ongoing, temporary wooden railings need to be replaced with permanent fixtures, and it’s quite possible my previous suggestions are already in the works.